Dr Idrees Ahmad, Leila Al-Shami, Dr Abdulkarim Ekzayez with Jeremy Bowen. 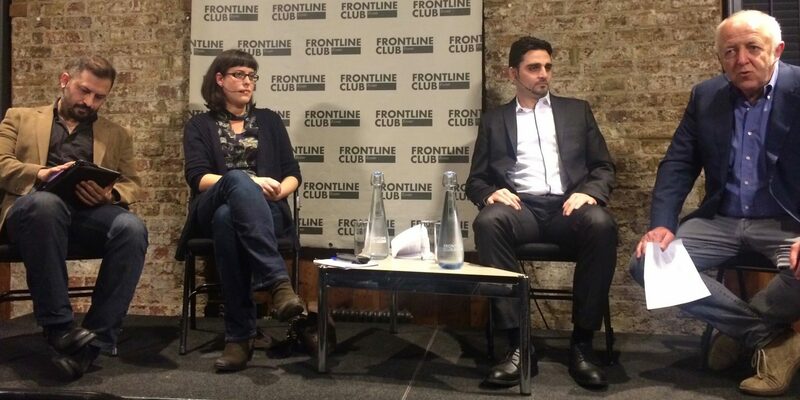 The escalating humanitarian crisis in the suburbs of Damascus due to the Syrian civil war was the subject of discussion at the Frontline Club on Tuesday 13th March. The area of East Ghouta is said to be one of the last strongholds of resistance by Syrian opposition forces and as such the target of renewed violence by the forces of President Bashar al-Assad and his foreign allies. The panel invited for the talk included Dr Abdulkarim Ekzayez, a Syrian medical doctor and an epidemiologist; Leila Al-Shami, a founding member of Tahrir-ICN, a network that aims to connect anti-authoritarian struggles across the Middle East, North Africa and Europe along with Dr Idrees Ahmad, a Lecturer in Digital Journalism at the University of Stirling. The evening was hosted by BBC Middle East editor Jeremy Bowen. We see the same patients that we discharged a few days ago, with even more serious injuries, but they (hospitals) don’t have space to treat patients, they don’t have the medical supplies…they don’t have food, water or any essentials. Even the word catastrophe can not describe what’s happening in East Ghouta. He went on to explained that the Assad regime causes delays and confiscates certain medical supplies provided by UN humanitarian convoys and they hardly reach the population or meet their basic needs. This should not be a negotiating principle, this is a basic humanitarian standard. The aid has to reach these communities in need. We need more efforts, we need air drops of aid. The international community has to start asking questions when a regime purposefully stops aid and starves people, what they can do? Further along in the discussion Bowen turned to Dr Idress to see what he thinks the international community can do besides watching the conflict unfold and discussed UN’s classification of words such as ‘besiege’ and ‘hard to reach areas’. The problem is that the UN has no international backing. The UN alone cannot enforce resolutions. Its efforts have been repeatedly thwarted even for humanitarian efforts and we have had 11 vetoes from Russia which blocks any kind of accountability. In the absence of this it doesn’t have any mechanism with which to confront the regime. So, it’s incumbent on the states which are supposed to be guarantors of world order, but what we have seen is a collapse of that. One of the questions raised from the audience in this open discussion was on the support for the Syrian government. On this Dr Ekzayez commented that the Syrian regime is not similar to any other authoritarian regime. It relies roughly on 2500 people within its core structure and each person from this inner core was holding positions of power within institutions such as the army, The Ba’ath Party and society agencies. They similarly had links within communities who had shared interests with the regime. After the formal ending of the conversation for the evening the panel and audience continued to discuss their individual points on the unfolding of events in East Ghouta in the members room on the lower floors of the Frontline Club.